Is your Mountain Bike growing dusty in the garage or seeing too much pavement? Want to learn how and where to ride a Mountain Bike in Michiana? 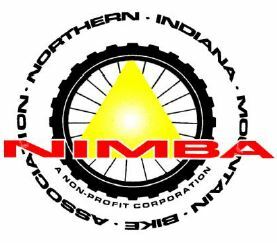 The Northern Indiana Mountain Bike Association (NIMBA) is holding free “Intro to Mountain Biking” sessions at each of the 4 trails that it maintains. Each session will include a discussion and demonstration of basic Mountain Biking skills followed by a guided ride on the trail where we will put the skills to use and review features of the trail. Attend one, or attend them all! Please RSVP by sending an email to NIMBA.BIKE@GMAIL.COM. This will be a great way for any rider beginner or expert to gauge their improvement or for some just racing for bragging rights with their friends or even just coming out to have some fun, fellowship and getting some quality trail time in. Based on Insurance coverage, the Race is FOR MEMBERS ONLY. NON NIMBA MEMBERS can purchase a NIMBA membership for only $20. Membership forms will be available at the races. Depending on the venue, we may create a beginner loop. Depending on how many show up, we may create classes. Ride with Mayor Allan Kauffman on Monday, May 14, to kick off Goshen’s Bicycle-to-Work Week. The City’s Week is May 14-18, and the Maple City Bicycle Advisory Committee (MCBAC) is encouraging people in Goshen to consider the possibility of biking to work that week.